What a great film in which tradition and ritual are questioned while we audience members are confronted with our own emotions and views on morality. This is accomplished by a layered story that is slowly revealed through multiple character perspectives as well as flashbacks. 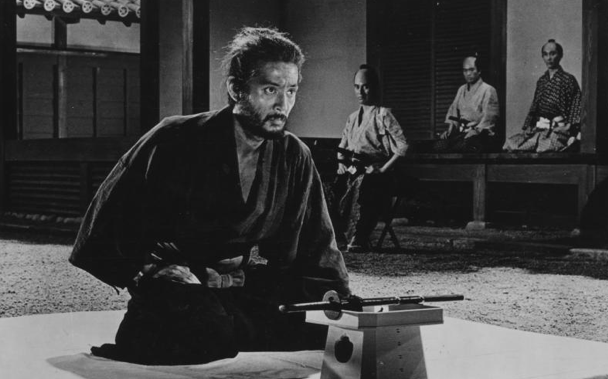 Although film is a great medium to reveal character through action, Harakiri plays with time and perspective and shows that the artform has so much more to offer. 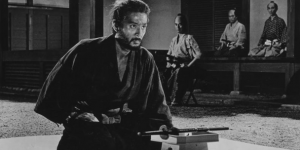 The film begins when a ronin, that is a samurai with no master, arrives at a lord’s house and asks to commit one last honorable act – harakiri, that is suicide by self-inflicted disembowelment. We learn through exposition that times are tough and many former samurai can find no work and struggle to survive. Some ronin begin making calls at lord’s houses, asking to commit harakiri only to be pitied and sent away with money and food. Many calculating former members of the warrior class use the idea of harakiri as a ruse for extortion. This house takes a stand to call any ronin‘s bluff and force them to go through with the ritual. Through flashbacks and jumping from one character’s story to the next, we learn that the previous ronin was “allowed” to go through with the ritual with his own sword, one made of bamboo. We also learn that he was forced into the unfortunate situation because of his need of money for his sick wife and son, having previously sold his sword in exchange for one made of bamboo. And we also learn that the previous ronin was the son of the current one asking to commit harakiri. And still more is revealed. This film works so well that we initially agree that the house should force calculating ronin to eat their own words and commit harakiri. However by the end when all is revealed, we are confronted with our conservative feelings and realize that the ploy was an act forced by unfortunate circumstances and a system steeped in tradition and ritual that hurts more than it helps. People do things that are wrong all the time, however we need to consider the choices that were available to them in the first place. Interestingly, movies can be used to fulfill an egotistical need for escape by action and spectacle yet at the same time, through a simple tool such as the flashback , they can force us to become quite empathetic to others. Playing with time and perspective is well done here and creates a story that is not held to the specific time and place of feudal Japan, but is worldly and timeless.